One of the most common questions of new pool owners and people looking to purchase a Swimming Pools is "How do I take care of my pool now that I have one?" Pools are really not that difficult to maintain - weekly maintenance and keeping the water balanced are the keys to a "Happy Pool". The first thing I always recommend is to keep your pool water "balanced". This is simply making sure the pH, alkalinity, calcium, cyanurac acid, and chlorine are within normal ranges. These can been monitored at home with either a test kit or test strips. Personally, I like the test kit but most homeowners like the strips because they are fast and easy to use. I would also recommend having your water professionally tested at a Pool Store (like Big Kahuna) as least once a month. We have some people who have their water tested once a week year round! By keeping your water in balance the chlorine will work more efficiently and you will use less over the course of the swimming season. Proper water chemistry can also extend the life of your pool equipment. Keeping the floor, walls and surface clean is the next step. I always recommend brushing the walls and floors of pools to help keep them clean. The debris gets into the water and the filter helps to take the "dirt" out of the pool. Brushing does not always get the job done so vacumming a pool is sometimes necessary. A manual vacumm is the least expensive way to go. There are alternatives to the manual vacumm, these can run on their own pump (pressure side cleaners), they can be attached through the skimmer (suction side cleaners) or they can be robotic (they run off electricity). 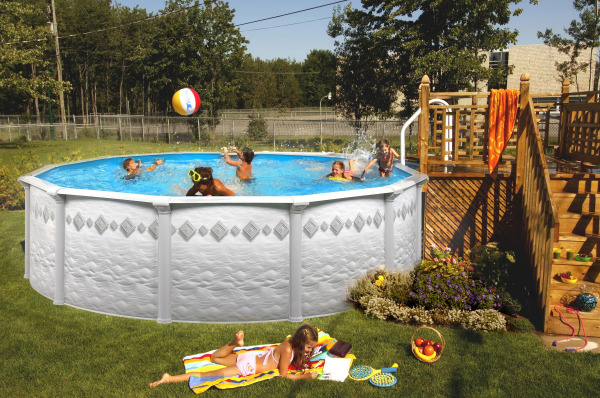 Whether you have an above ground or inground pool there is an automatic cleaner available for your pool. A quick skim of the surface of the water with a skim net is always a good idea. The only other normal maintenance needed is cleaning the filtration system. Whether you have a cartridge, sand or DE filter it will need to be cleaned periodically. Cleaning is done either through backwashing or rinsing off a cartridge. Proper care and maintenance not only keeps your pool looking its best, it will help prolong the life of your equipment.